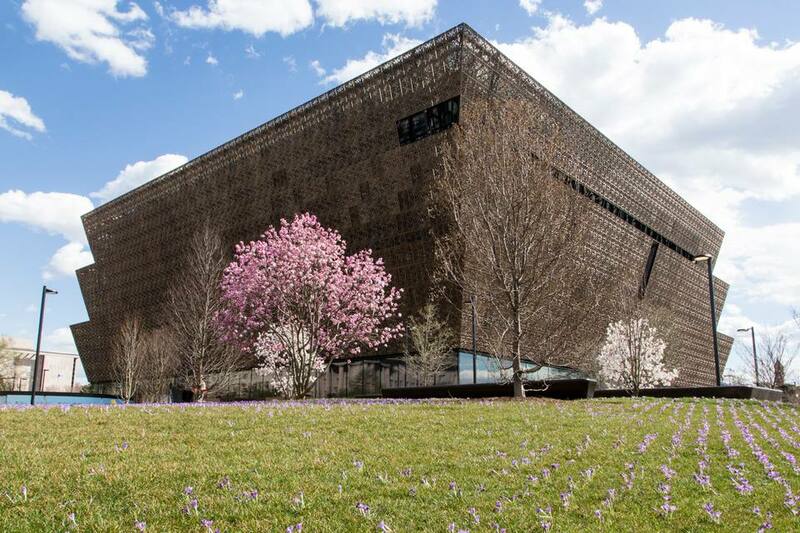 All About the African American History and Culture Museum in Washington, D.C. The National Museum of African American History and Culture is a Smithsonian Museum that opened in September 2016 on the National Mall in Washington, D.C. The museum features a variety of exhibits and educational programs on topics such as slavery, post-Civil War reconstruction, the Harlem Renaissance, and the civil rights movement. It is the only national museum devoted exclusively to the documentation of African American life, art, history, and culture. The new attraction has been very popular since its opening and draws large crowds from around the world. Due to the museum's popularity, free timed entry passes are required to visit. Same-day timed entry passes are available online through ETIX beginning at 6:30 a.m. daily until they run out. A limited number of walk-up passes (one per person) are available starting at 1 p.m. on weekdays on the Madison Drive side of the building. No walk-up passes are available on Saturdays or Sundays. Advance timed entry passes for individuals are released monthly. Check availability for advanced tickets. The National Museum of African American History is located at 1400 Constitution Ave., NW Washington, D.C. adjacent to the Washington Monument. The nearest Metro Stations are Smithsonian and L’Enfant Plaza. Regular operating hours are from 10:00 a.m. - 5:30 p.m. daily. Slavery and Freedom - Personal stories highlight the economic and political legacies of slavery, beginning in the 15th century with the transatlantic slave trade, through the Civil War and the Emancipation Proclamation. Defending Freedom, Defining Freedom: Era of Segregation 1876–1968 - The exhibition will illustrate how African Americans not only survived the challenges set before them but crafted an important role for themselves in the nation, and how the nation was changed as a consequence of these struggles. A Changing America: 1968 and Beyond - Visitors learn about the impact of African Americans on life in the United States—social, economic, political and cultural—from the death of Martin Luther King Jr. to the second election of President Barack Obama. Musical Crossroads - This exhibit tells the story of African American music from the arrival of the first Africans to today’s hip-hop. The gallery is organized through stories of musical genres and themes rather than chronologically, covering classical, sacred, rock ’n’ roll, hip-hop and more. Taking the Stage - Visitors will see how African Americans transformed the ways they are represented in theatre, television, and film by challenging racial discrimination and stereotypes and striving to produce more positive, authentic and diverse images of African American identity and experience. Cultural Expressions - This exhibition serves as an introduction to the concept of African American and African diaspora culture. It examines style, food, artistry, and creativity through craftsmanship, social dance and gesture, and language. Visual Arts Gallery -This art exhibition will illustrate the critical role that African American artists played in shaping the history of American art. It will feature seven thematic sections and one changing exhibition gallery. Works will include paintings, sculpture, works on paper, art installations, mixed media, photography, and digital media. Power of Place - The idea of place is explored as a crucial component of the African American experience through an interactive multimedia area called the Hometown Hub. Places highlighted include: Chicago (black urban life and home of the Chicago Defender newspaper; Oak Bluffs (leisure in Martha’s Vineyard, Mass. ); Tulsa, Okla. (Black Wall Street, the story of the riot and rebirth); South Carolina’s low country (a story of life in the rice fields); Greenville, Miss., (images of segregated Mississippi through the lens of photo studio); and Bronx, N.Y.
(a story about the birth of hip-hop). Making a Way Out of No Way - The stories in this gallery show the ways in which African Americans created possibilities in a world that denied them opportunities. These stories reflect the perseverance, resourcefulness, and resilience required by African Americans to survive and thrive in America. Sports Gallery - This exhibition will look at the contributions of athletes, acknowledging that sports were among the first and most high-profile organizations to accept African Americans on relative terms of equality, sports have a unique role in American culture. Artifacts on display will include sports equipment; awards, trophies and photos; training logs and playbooks; and posters and flyers. Military History Gallery - The exhibition will convey a sense of appreciation and respect for the military service of African Americans from the American Revolution to the current war on terrorism.